After operating in high gear in the weeks leading up to finals, Wellesley students can use some help in chilling out. That is officially provided courtesy of the Wellness Outreach Committee*, which offers a reading period schedule of fun and relaxing events. 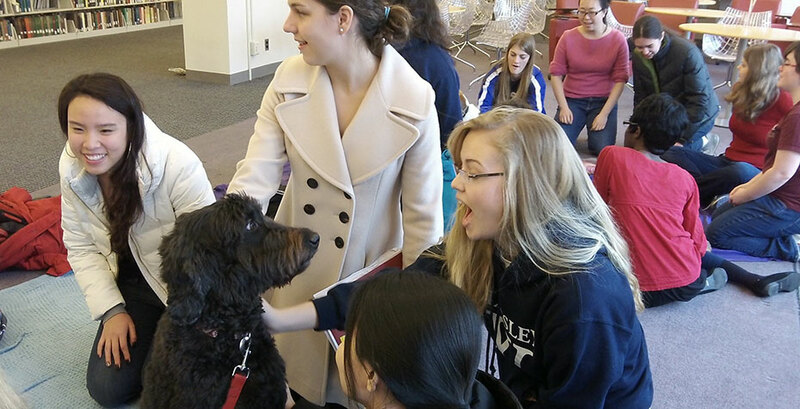 Always a favorite is a visit from therapy dogs, who this year will be on campus at various locations on December 11. Also on the docket for the coming week are daily drop-in exercise opportunities from open swim to Fab Abs. Meditation and Labyrinth walking are offered every day too, and different residence halls have some of their own programming. And of course, snacks. Music in the Greenhouse happens Friday and Saturday; a chance to let your brain try something new comes with Hour of Code on Wednesday and Friday. And of course, snacks. Make Your Own Snack station travels to different dining halls December 10-12, and Moonlight Breakfast strikes from 9-11 p.m. on Sunday in Bates Dining Hall. The entire schedule is on Facebook. In recent decades students have developed an end-of-semester tradition: Primal Scream. At midnight on the last day of reading period, students stop what they're doing, step outside, and let it all out. One student told us, "Even though I haven't actually participated, you can still hear it when it happens, especially in Tower Court. Students go outside and scream for a couple of minutes, and then rush back inside to escape the cold. Some just stick their head out their window and join in!" *And partners, who include: Counseling Service, Health Service, PERA, Davis Museum, Ferguson Greenhouses, LTS, Office of Religious & Spiritual Life, and Wellesley Fresh.